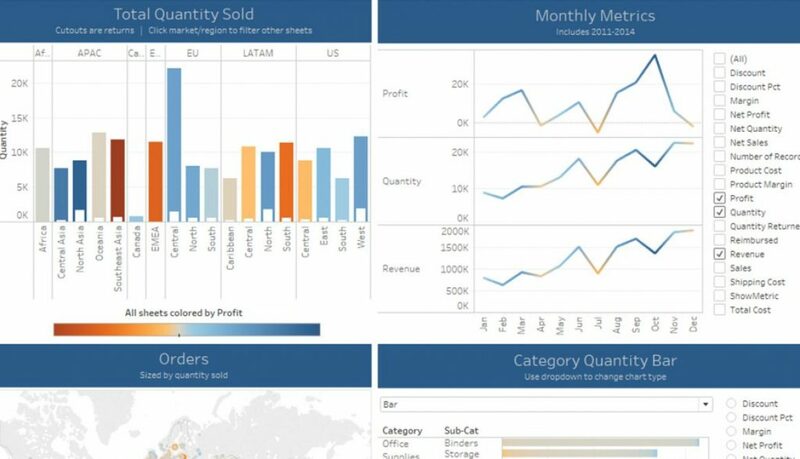 Using Tableau’s SuperStore data sample, this is only the first of many dashboards showcasing what BluePath can bring you. If you want specific examples, need advice on design or strategy, or are having trouble with something, we are always willing to lend a hand. Please, send us a message any time! First up in this workbook, we have the Rgn dashboard, a regional breakdown of various metrics. When would this be applicable? Your company has various sales regions and the field leadership wants to monitor the big picture as well as the nuances. As a result, it’s possible to spot problem areas or products and figure out roots causes. This version uses device settings to respond to the width of a monitor, tablet, or phone. Below, the image is sizing to the set width of the blog, 1170px. The full-width version can be seen here or click the Full Screen button in the Tableau toolbar at the bottom of the viz.